We believe in the value of North American craftsmanship. That’s why we offer North American made products for every room of your home. We’re proud to say that all of our upholstery and much of our wood products are made in the United States. These pieces provide our customers with the best quality for their investment, while also allowing us to reduce our carbon footprint. Look for the American and Canadian flag icons we proudly post on these items. At Boston Interiors we strive to follow socially and environmentally responsible retail practices. Each year, in our warehouse facility alone, we recycle approximately 300 tons of plastic and cardboard packing materials. We also participate in recycling programs at our offices, and we have energy efficient lighting throughout all of our store locations and distribution center. Furniture made by manufacturers who are members of The Forest Stewardship Council (FSC), The Sustainable Forestry Initiative (SFI), and The Sustainable Furniture Council (SFC), all of which practice sustainable forestry. We partner on a regular basis with 1% For the Planet and give back to environmental organizations in New England. Upholstery that complies with the CARB regulation. Cushions constructed with soy-based foams and recycled fiber filling. Natural materials such as bamboo, cotton, linen, hemp, abaca, silk, wool & jute. Organic fabrics that are bleach-free. Cushion Springs made from recycled iron ore.
Use of water based paints and finishes. Mattresses certified by CertiPUR-US are made without ozone depleters, without PBDE flame retardants, without mercury, lead, and other heavy metal, without formaldehyde, and without any phalates not regulated by the Consumer Product Safety Commission. View our eco-friendly products and look for the green leaf icon on our items. Performance fabrics are textiles engineered to resist fading, stains, abrasions, and pet-hair damage. 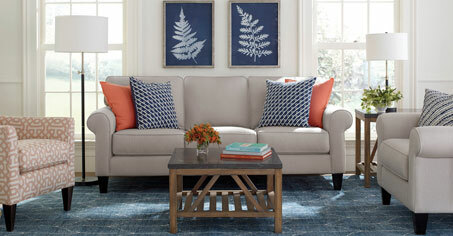 At Boston Interiors, we offer Sunbrella and Crypton brands, among others, as part of our performance fabric collection. Sunbrella is made of acrylic fibers with pigmentation added prior to extrusion. It offers the rich look and feel of cotton, but does not fade or degrade. Even in the brightest sun, Sunbrella offers years of carefree service. 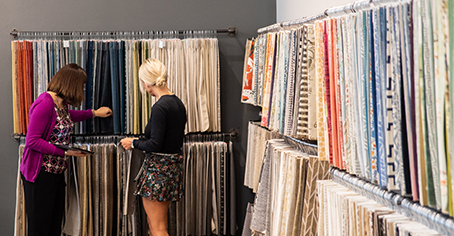 Crypton home fabrics are engineered performance fabrics, encapsulated with technology that provides extreme stain resistance, easy stain release and odor resistance that won't wear or wash away. These qualities are permanently bonded to the fiber, resulting in a long-lasting, easy-to-clean, soft fabric that endures the messes of everyday life and remains as beautiful as the day it was purchased. Liquid-repellant and easy to clean, performance fabrics offer years of care-free maintenance when it comes to caring for your upholstery. Look for the performance fabric icon on our frames stocked in performance fabrics. We have dozens of other collections available in performance fabrics by special order. If you would like to see fabric swatches of these or any of our other fabrics, please call or stop into a store to explore all the possibilities!